Autumn has finally come to an end here in Argyll. As I write this article sleet and rain lashes against the window and strong winds strip away the remaining colour from the trees, the leaves giving up their tenuous grip having been weakened by hard frosts earlier in the week and Snow has made a dramatic return to the mountains hereabout. Looking back it really has been a fantastic season, by far the best I have experienced since moving here in 2004. This year the change started early too, I noticed the first hint of gold in Beech trees back in mid August and was initially concerned that the whole show could have been over by the middle of October. Fortunately, early September proved to be mild and settled slowing down the transformation, ensuring that Birch, Beech, Oak and Larch ( my Autumn favourites) all reached their peak together. The twelve weeks of colour this year has enabled me to get out and develop further a number of projects that I had started in previous years and to visit and reconnoitre a number of new locations further afield. The season has been a wet one too with frequent spells of stormy weather often lasting for days on end. My first Autumn in Scotland was very similar but I failed to capitalise on the opportunities available here in Argyll, its ancient Oak forests are world renowned, the 'Great Northern Rainforest' the last remnants of forests that rapidly covered the whole of Britain after the last Ice Age that were decimated during the industrial revolution. Back in 2004 I waited for weeks to get out on the few blue sky days that we had and in the end made very few satisfactory images. 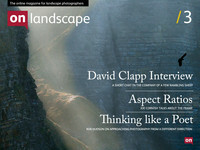 Indeed I wrote an article for Outdoor Photography magazine based around the story of the long wait as a viewpoints feature in 2005. Having spent six years now on this wet and stormy coastline my photography has completely changed, the less frequent blue sky days being my opportunity to catch up at the gallery or with my admin work. Cloud and rain diffusing the light and revealing all the subtlety and beauty in this rich landscape. Due to the wet weather this year has been vastly different and very productive. From Mid Argyll to Sutherland via Loch Ness and Glen Affric and inland to the woodlands and lochs of the Trossachs I have been out trying to capture the colour and mood of the season as it has presented itself. On a corrugated shed, Loch Lomond. At no other time of the year do I feel such a strong connection with nature, effecting all of the senses. The rich tapestry of golds, reds and ochres filling the valleys and glens. The earthy smell of of wet woodland with its carpet of decaying foliage. The first frosts of the year tugging at the back of my nose and sitting heavy in my lungs as I head out onto the hill. The patter of fat dew drops falling from branches in a fog filled forest. It's a time of year that never fails to awaken a primaevil urge in me to head back to my cave, store up plenty of comfort food and hunker down for the coming season. An urge that has to be supressed as a landscape photographer since another great thing about Autumn is that it is followed immediately by Winter, my Favourite season! !